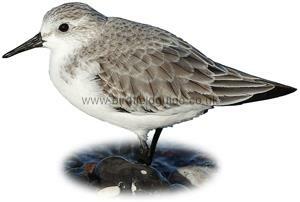 In winter the Sanderling has a pearly-grey back and bright white underside. It has black legs and a black bill. It also has a black shoulder patch which is not always visible. In winter the Sanderling is by far the whitest wader to visit the UK. 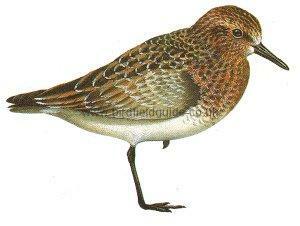 A particularly active little bird which runs along sandy beaches at great speed moving in and out with the waves. 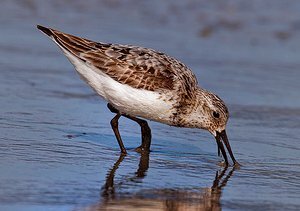 The Sanderling is one of the most active waders, running in and out with waves on the beach and rarely standing still, unless roosting at high tide. This image shows typical winter plumage, note the overall pale appearance. 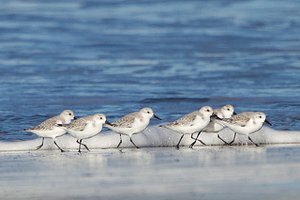 The Sanderling is one of the whitest waders in winter. 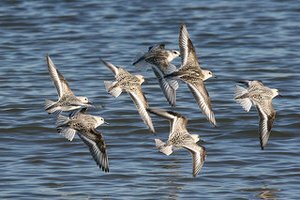 Also pale in flight the Sanderling is often seen flying in small groups along sandy beaches. Mostly breeds outside of Europe in Northern tundra such as Siberia. 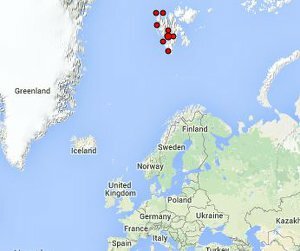 The only confirmed breeding sight in Europe is on Svalbard islands, Norway. In Winter it moves South and can be found on most European coastlines. Some none breeding birds stay South and can be seen regularly in summer plumage in places such as the Western Isles in Scotland. Usually nests on Arctic tundra. 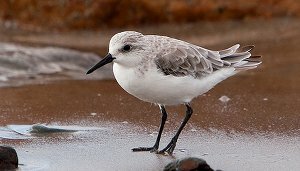 In winter the Sanderling is nearly always found on sandy beaches. Note the strong contrast between the chestnut upper breast and the white lower breast. Also note how the legs and bill are jet black. The Sanderling's summer plumage is much darker than the light winter plumage. The dark upper chestnut colour contrasts sharply with the birds bright white underside.